By using reverse DNS (also known as rDNS or PTR record) you link an IP address to a domain name (usually a subdomain). This is the opposite of regular (forward) DNS where you connect a domain to an IP. If you request the IP address of mail.example.com (with a DIG command) you will receive 123.123.123.123. If you do a reverse DNS lookup of 123.123.123.123 you will receive mail.example.com in this case. Reverse DNS is used, among other things, to find out where an email message is sent from. This adds an extra layer of security to email. Many email servers are configured to reject email or mark it as spam more quickly, if no valid reverse DNS is set for it. 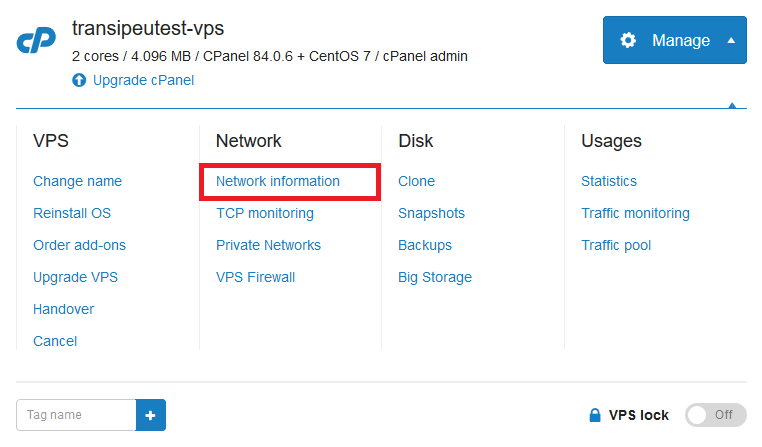 In the control panel go to BladeVPS and click the name of your VPS. Click 'Manage' > 'Network information'. 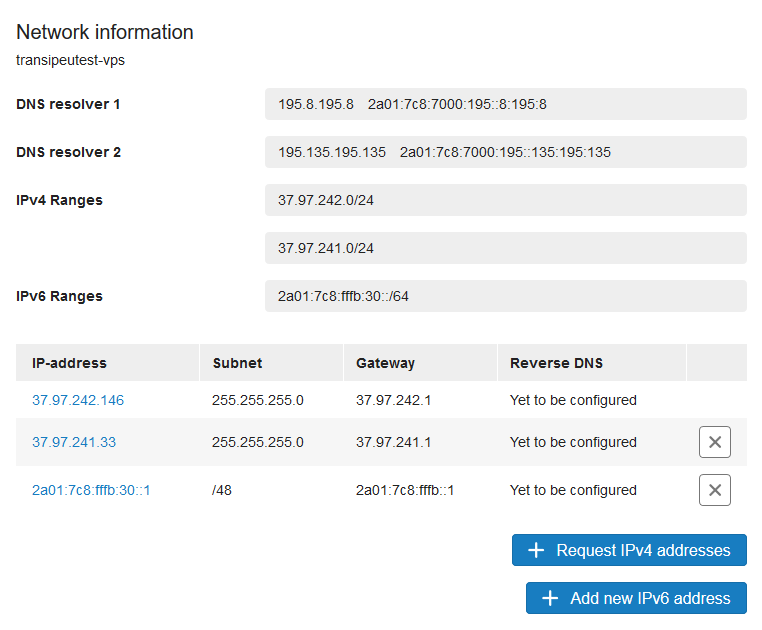 Click on the IP address for which you want to set the 'Reverse DNS'. Enter the desired reverse DNS name and then click on ‘Modify Reverse DNS’ to save it. When entering the reverse DNS we recommend choosing the hostname of your VPS or the domain from which you send mail: so for example server.yourdomainname.com or mail.yourdomainname.com. Next set up DNS records for your chosen reverse DNS in your DNS settings. For example, in the screenshot above there are 4 IP addresses for which you would create the following records in your DNS settings. If you also use the IPs for which you set up reverse DNS for the root (@) of your domain, you can use CNAME records as shown below. Your PTR record will be recorded by our name servers within a few minutes. For more information, see the article: 'Why am I not seeing my DNS change yet? '.